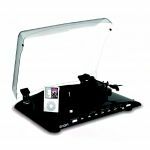 DISCOVER DJ PRO is a complete DJ system that works with the music on your Mac or PC – and your iPod. 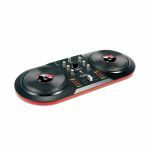 It’s designed to directly connect to your computer so you can mix your favorite tracks with performance DJ controls. Plus, you can dock your iPod or iPhone to play tracks or record your mix. DISCOVER DJ PRO gives you the classic two-turntables-and-a-mixer setup used by DJs everywhere. You can scratch, mix, loop, and much more. DISCOVER DJ PRO also has all the inputs and outputs you’ll need for your headphones, speakers, and a microphone. DISCOVER DJ PRO is also ultra-portable, so you can grab it and go, ready to DJ anywhere. - iPod dock for mixing, recording, and playing your sets. 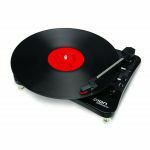 - Large, touch-sensitive turntables for accurate control and scratching. 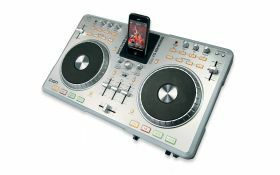 - Standard layout with two turntables and a mixer. 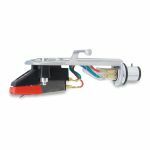 - Connections for speaker systems and headphones. - Includes Virtual DJ LE software. - Integrates with your iTunes library to play and mix songs. - Sort by genre, BPM, artist, and more. - Info tab includes cover art and song rating. - M4A, AIFF, WAV, MP3, FLAC and OGG audio file support. - MIDI-over-USB controller is compatible with virtually all DJ software. - Charges your iPod when used with power adapter (sold separately).